Connections with others in your field or those who share your special interests can provide the best source of opportunity or support. Watch for deception from those who feel threatened by you, even if you feel that their perceptions are incorrect. Stress continues to drain your energy, and you might benefit from tension-relieving techniques. Schedule a massage on the 6th or 7th, and take some time out after the 20th to just enjoy yourself. Sending the wrong signals can get you into hot water from the 1st—18th, so be aware of what you're projecting. It's also easy to become infatuated with the unattainable. Be direct if you want something, as long as you don't intimidate the person you're trying to impress. Perhaps you're feeling too hemmed in, but pointing fingers at someone else as the cause doesn't really resolve the problem. Find a way to begin anew, or look for avenues that clarify misunderstandings. Navigating the waters toward success reveals a few sharks, but you can deal with them. You can fall victim to deception from the 4th—17th. Check out details during the Moon on the 13 th, or consult someone who can see through the smoke screens. 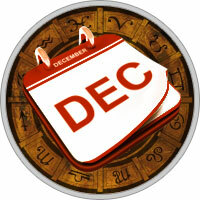 During Mercury's retrograde from the 7th—27th, renegotiate or investigate other possibilities. Don't make a final decision about long-range matters, since there are too many unknowns to choose with any confidence. A surprising turn of events opens doors to success from the 25th—31st. Step into a different direction during the Moon on the 29th.